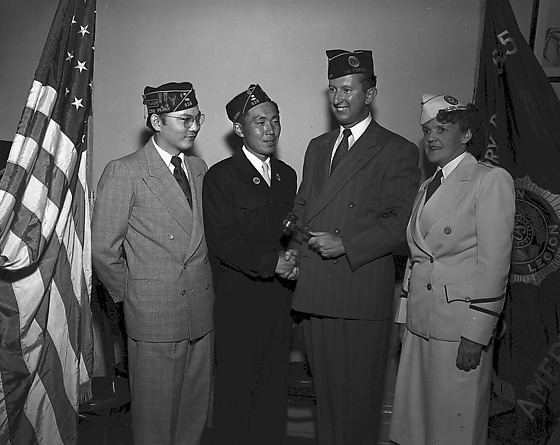 Caucasian man, past commander of 17th District Ronald Soucey, and Japanese man, Casey Minoru Kasuyama, shake hands as Soucey hands over a gavel for American Legion Perry Post 525, Los Angeles, California, August 28, 1951. They are flanked by a woman in uniform, Captain Esther Brien of the Women's Auxiliary, and a man in a suit, past commander of Nisei post, George Ozaki. All wear garrison caps with patches and pins. American flag at L, American Legion flag at R.
Typed on original negative envelope:: American Legion Perry Post -- Casey Kasuyama.